Sashimi, as an experience, is one that treads a fine line between good eating and amoebiasis. People have eaten raw seafood for ages, but with all the talk of red tide and food poisoning, sashimi is a calculated risk. Most would take raw fish, but I decided to push the limit a bit. 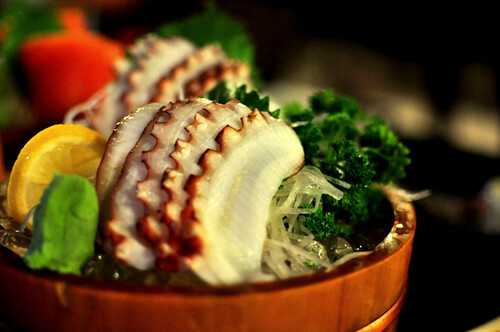 That’s right: octopus sashimi. Last week, me and a couple of friends decided to chill out at Little Tokyo, which is a bunch of small Japanese restaurants just along Chino Roces (Pasong Tamo). There was camphone paparazzi/photographer extraordinaire/pet society guru Fritz Tentativa, and everyone’s favorite blogging impresario-slash-virtuoso Winston Almendras. Chilling meant salmon sashimi for Fritz and California maki for Winston, but for me it meant something more exotic. Beer, of course, and octopus.